A team of graduates from Liberty Baptist College (now Liberty University) in Lynchburg, Virginia, came to Central Ohio together and started New Life Church in Gahanna, Ohio. The small group of young people began meeting in the basement of an apartment while going door-to-door New Life began public meetings at Gahanna Middle School West in June. Many people came to Christ and the number of families from the community increased rapidly. 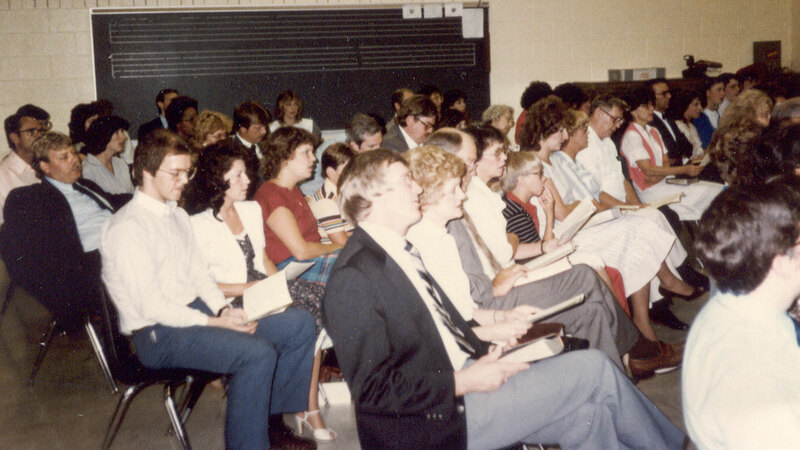 As the church grew, the Celebration gatherings moved from the school music room to the cafeteria and then to the school auditorium. Classes met in hallways, small side rooms...anywhere there was space. New Life officially chartered in October with Dr. Elmer Towns leading the Chartering Service (check out the actual charter document in the hall outside of room 106 in the main building at the Gahanna campus). New Life began to outgrow the school space and the contract with the District was coming to a close. God’s provision allowed the church to purchase a 10-acre property on Stygler Road in Gahanna and began to build its first worship space. Many of the families signed over their personal homes in a huge act of faith as a guarantee for a bank loan. A Ministry Partner of the church stepped into the role of Building Supervisor and much of the work on this first building (now the KidzLife wing) was done by volunteers who worked every possible hour of the day during their time off from work. The new auditorium was packed for the Dedication Celebration as New Life moved into it's new home as Drs. Jerry Falwell, Sr. and Elmer Towns led the service. Since then, the campus has expanded as more space has been needed for the growing congregation and ministry needs. As attendance increased, more classroom space was needed. A generous donor gave all the funds needed to build a 3000 sq. ft. building with 6 classrooms. Today this building is called the Annex building and is used for New Life’s large dance ministry classes as well as Awana and event space. New Life undertook a huge construction project that more than quadrupled the size of the facility -- including a large lobby, classrooms, large restrooms, a kitchen, a prayer chapel and a 900-seat worship area. Growth continued and the number of Celebrations was increased to 3 – 1 on Saturday and 2 on Sunday. Large seasonal drama and music presentations were presented with 5-6 shows offered in order to accommodate the crowds. Extensive office space, Student Ministry activity space, and Cafe' space were added to meet the needs of even further growth in both the staff and congregation size. The old house that had been used for offices was transitioned to storage as operations moved into the new space. This 2-story building was dedicated to and named for Dr. Elmer Towns because of his ongoing support and encouragement to New Life Church. In addition to use by our Middle and High School Ministries, the second floor space is also used for Gahanna-Jefferson Schools tutoring space, AA meetings as well as monthly gatherings for married couples and family events. Student Ministry offices are also located upstairs. New Life’s first Senior Pastor, Dave Earley stepped down in June 2005 and in August 2005, the congregation voted to name Steve Benninger Lead Pastor. Over the next 12 years, New Life would see continued growth and the addition of new staff members to oversee small groups, international missions and communications among others. Extensive changes were made in the Worship Arts Ministry with a greater focus on our worship bands and weekend Celebrations. New Life has grown from 12 people, to an average weekly attendance of over 1200 at 2 locations and leadership and staff of over 40. New Life is a multi-ethnic, multi-generational church is Gospel-Driven, leading people into a transforming relationship with Jesus through the Gospel. New Life is unique, with nearly 80% of ministry partners having a weekly place of ministry in the church and half being part of a weekly Small Group. Outreach Ministries continually expand to the surrounding communities, including some of the neediest areas of Columbus. New Life partners with Victory Center of Hope in Whitehall, GRIN (Gahanna Residents in Need), Neighborhood Bridges of Gahanna, Stowe Center in inner-city Columbus, and Lower Lights Ministry in the Franklinton area of Columbus. Our LoveWorks trailer is well-known in the community as it is used to offer neighborhood events that include bounce houses, music, games and food to our community. Expanding across the globe, New Life works along-side and regularly sends ministry teams to our partner ministries in Uganda, Coast Rica, and France as well as with several other people groups around the world. Focus is given to long-term, intentional, relational efforts cross culturally. New Life also partners with Samaritan’s Purse for disaster relief, Operation Christmas Child, and other “immediate need” ministries. There is also a strong Small Group Network of over 80 small groups allowing members to build close relationships in a smaller setting apart from the weekend Celebrations. These groups are led by ministry partners committed to personal ministry. Ministries to women, families and couples, those in addiction recovery, blended families, children and adults with special needs and those in need of counseling are a large part of New Life’s ongoing ministry to the many facets of need in our culture. Believing that ministry is best accomplished through each and every individual personal spiritual development, New Life regularly offers classes, seminars and weekend events on a variety of theological, biblical and personal growth topics. New Life is committed to mentoring and hundreds of individuals discover growth as they build these 1-on-1, inter-generational relationships. New Life is a church that "gives itself away" as we plant new churches throughout Central Ohio and beyond. Currently, New Life has daughter churches in Canal Winchester and Clintonville. In 2015, our second campus began in Whitehall. A brand new location on Yearling Road allows us to be in the “center” of the city close to the high school and government offices. That congregation now has over 150 people and is ministering intently to the people of Whitehall. We are excited for all that God has in store for us in the years to come and He draws people to Himself and into His Kingdom.